Quinessence luxury Detox Bath soak contains a purifying blend of the finest organic essential oils including Juniper Berry, Fennel, Grapefruit and Cypress to help your body flush out those nasty toxins efficiently. To complement these essential oils we have also included detoxifying marine botanicals of Atlantic kelp, Algae, Irish Moss, Bladderwrack and Seaweed - Seaweeds have a wide range of uses and many species contain proteins which help to fight premature ageing of the skin. Bladderwrack contains vitamins A, B1, B2, B3, B5, B12, C, D, E and K, and a wealth of minerals including calcium, copper, chlorine, iodine, iron, magnesium, manganese, nitrogen, phosphorus, potassium, sodium and zinc. This is why it offers such an amazing wealth of beautifying properties including rehydration, remineralisation, cell regeneration, detoxification, purification and oxygenation. 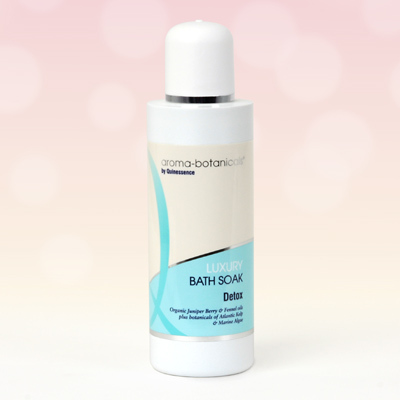 Enjoy a relaxing Detox Bath Soak - and pamper your skin with nourishing botanicals at the same time. Your body will thank you for it afterwards! Aqua, TEA Lauryl Sulfate, Hydroxyethylcellulose, Sodium Lauroyl Oat amino Acids, Cocamide DEA, PEG-3 Distearate, Sodium chloride, Lauryl betain, Panthenol, Punica granatum, Limonium vulgare, Chondus crispus, Thymus serpyllum, Fucus vesiculosus, Algae, Juniperus communis, Foeniculum vulgare, Citrus paradisi, Cupressus sempervirens, PEG-15 cocopolyamine, Glycerin, Citric acid, Benzoic acid, Gluconolactone, Sodium benzoate, Calcium gluconate, CI 75810.